Our Liberty location is at 8600 N. Church Rd., Kansas City, MO 64158. Our Liberty center is our newest location and just opened in January 2017. This location is in Wilshire Plaza in the same parking lot as Home Depot. We moved this center from Gladstone to be more accessible to additional clients in the northland! The staff at Liberty love their new location and t he clients love it too! The staff at Liberty care about every individual client. Our clients range from 8 years old to 90 plus, male, female, seniors, children and teens. We set up individualized programs for each client, and because of our individual approach, holistic health and one on one counseling our clients have accelerated weight loss. If you live or work in the area, stop by and see our newest location! 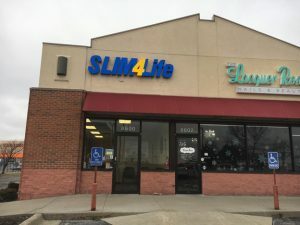 Make an appointment at our Liberty weight loss center today!